Did Ariana Grande Cover Up Another Pete Davidson Tattoo? The pop star and her former fiancé are both heavily inked. 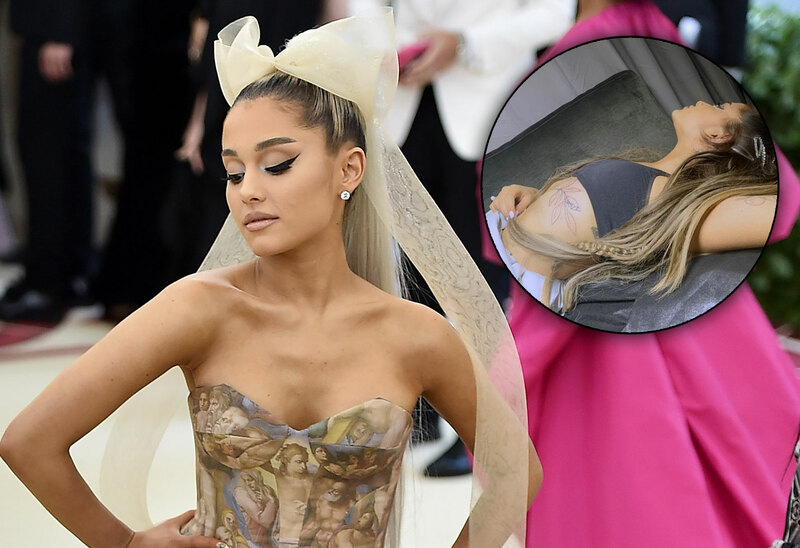 Ariana Grande has a new tattoo, and fans noticed she got it exactly where she once had a tattoo that honored her relationship with ex-boyfriend Pete Davidson. Was she trying to cover up the memories of her failed relationship? Click through the gallery for all the info on the new ink. @girlnewyork is her favorite tattoo artist. In the picture, Ariana’s torso is exposed, revealing a plant tattoo that wraps around the “Always” she got inked while she was still with Pete, 25. He got “always” done on his back, a reference to the Harry Potter books. “Not a cover up just evolvin 🌫,” she said of the new design. The word “always” isn’t completely covered and is still visible through the leaves. During Ariana and Pete’s short relationship, they got multiple sets of matching tattoos. She even got his dad’s firefighter shield number tattooed on her foot. Pete’s dad died on September 11th. Pete recently covered up one of their matching tattoos. Are you surprised that Ariana changed her Pete-inspired tattoo? Sound off in the comments!